Even more alarming is the disparity between the construction worker unemployment rate, over 17.4 percent, and the national average for all sectors, around 9.7. 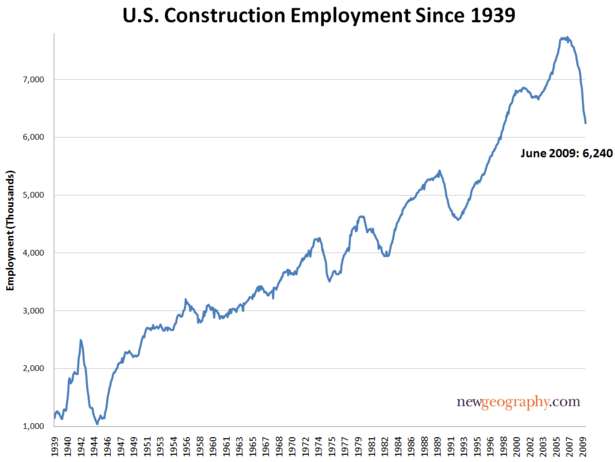 Construction employment is crumbling before our eyes. The current economic climate has not proven friendly to construction on the whole as state and local revenue continues to decline and little demand for commercial or retail facilities, as well as shrinking orders for new facilities, puts construction in a perilous zone. Though as recent as last November, President-elect Obama had conjured up a program to rebuild the nation’s infrastructure. The $787 billion American Recovery and Reinvestment Act would modernize roads, bridges, schools, and public transportation – among other things – and reinvigorate the floundering construction and manufacturing industries. These women’s groups seemed to misjudge the president-elects original plan designed to “stop the hemorrhaging in construction and manufacturing while investing in physical infrastructure that is indispensable for long-term economic growth” and instead turned the stimulus into an issue of gender politics. But from the first complaint, onward, the construction and manufacturing industries stood no chance. Obama changed his plan, adding health, education, and “other human infrastructure components” to his proposal. The act was signed into law on February 17 and over the past four and a half months some unfortunate figures have appeared. As noted previously, the construction industry is in a downfall, while there is a growing discrepancy between female unemployment rate (8 percent) and male unemployment rate (10.5 percent) – the highest male-female jobless rate gap in the history of the BLS [Labor Department] data back to 1948. All this data, however, has pushed the issue of gender-politics above the issue of human need. Now which group of people should make their voices heard? Let’s hear from women in the construction industry.